Mr Kenny was born and raised in Lapeer. He attended Mayfield Elementary, White Jr. High and graduated from Lapeer East. 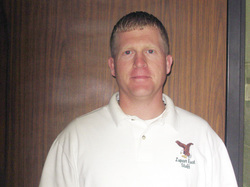 He earned his teaching degree from Saginaw Valley State University. He holds two master's degrees, the first in the Art of Teaching from Marygrove College, the second in Educational Technology from Walden University. He has been married for 18 years to Marie and together they have 4 children.